As soon as I got this book, I knew I wanted to review this book on a Sunday. 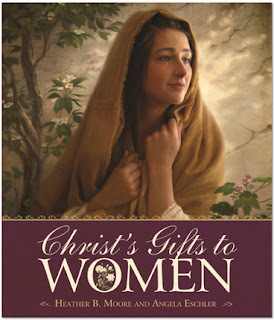 "Christ's Gifts to Women" by Heather B. Moore and Angela Eschler is a book with a powerful message about women and our relationship to Christ. At times, we as faithful Latter-day Saint women struggle to understand exactly who Christ is in our lives. We fail to comprehend the gifts He offers us as we strive to overcome the challenges we face. But Christ’s great message to us is that He has overcome this world—He has given us great gifts that empower and help us realize we are not alone. When reading this book, I was immediately mesmerized by the pictures of Christ and the message of the worth of women in His eyes. As women, we often downgrade our worth. We put everyone else above us and many times wonder how we matter and if we really make a difference. This book shows us that with the gifts of Christ, women CAN make all the difference in the world and we DO matter to Him. This is a book you will want to grace your bookshelf and your life for all time. You will want to read it to your daughters and granddaughters and buy a copy for all the important women in your life. With Easter coming up, this book will awaken in you the desire to come even closer to Christ and will make the holiday much more meaningful. Thanks so much for this kind review!